Ive been living quite happily with Acoustic Zen interconnects and speaker cables in my reference system for some time now. I use Silver Reference between my DAC and preamp and Matrix Reference between my preamp and amp (both interconnects are single ended). In my system, and for my tastes, this combination sounds neutral yet full of life -- not an easy balance to come by with cables in my experience, which is why Ive stuck with this combo for what in audiophile terms seems like an eternity. Ive had a few other cables pass through my system and make very good impressions in certain areas, but none has had enough overall chutzpah to make me want to abandon my current Zens -- until now. Matrix Reference II and Silver Reference II are the latest iterations of the Acoustic Zen interconnects that I've been using literally for years. Outwardly the Matrix Reference has gone from a lighter to a darker maroon, while the Silver Reference has gone the opposite route, from a darker to a lighter shade of gray. The Matrix Reference II can also be distinguished by new connectors that are now different from those on the Silver Reference but incorporate zero-crystal copper identical to that used in the cable itself. Internal upgrades include a change in the group dielectrics from polyethylene to Teflon tape, but the outer dielectric retains the original Teflon tubing of the earlier series. Overall geometry remains basically unchanged, but the Matrix Reference II conductors now incorporate 4% zero-crystal silver along with the copper (apparently the original Matrix Reference was 100% zero-crystal copper). The Silver Reference II continues to utilize 100% zero-crystal silver for its conductors. Another feature that hasnt changed is the price, which remain at $498 USD per meter pair for single-ended Matrix Reference II ($548 per balanced meter pair) and $948 per meter pair for single-ended Silver Reference II ($998 per balanced meter pair). All together, these changes may seem pretty minor on the surface, but as with most audio products, its often the sum of the small details that counts the most in the end. So it was with the new Zens. just about nothing. So I just let time do its thing. After a few weeks I substituted the interconnects one by one to gauge specific changes. I started with the Silver Reference II between my DAC and preamp. Any prior ambiguity as to whether there were differences between old and new interconnects was gone. My first impression of the Silver Reference II was very similar to my reaction to the excellent Ensemble power-conditioning equipment. Image precision and delineation improved noticeably, leaving individual instruments and vocals more identifiable in a three-dimensional space. Vocals were smoother but without loss of detail, and sibilants were handled more gracefully and naturally. Cymbals, especially the hi-hats, sounded much cleaner and clearer, with much less tizz and hash. This was surprising because I thought the original Silver Reference interconnects were pretty darn good in these areas. So version II of the Silver Reference managed to keep the positive aspects of the impressive original version while significantly improving and refining its few rough edges. It was an unqualified success in my book. The Matrix Reference II also improved in certain areas relative to its older sibling. Detail retrieval increased markedly, while the bottom sounded like it had a run-in with Dr. Atkins ghost. Before, I could not have lived happily with two pairs of the original Matrix Reference interconnects in my system due to an overabundance of upper-bass/lower-midrange lushness and softened transients. I did not get that feeling with the newer version. Unfortunately I didnt have two pairs of the Matrix Reference II with which to test this theory, but suffice it to say the newer version is cleaner, cooler, and subjectively quicker and more neutral than its predecessor. Cable recommendations are some of the most difficult to make, and this is especially true when e-mail is the way you communicate. With no vocal or facial cues, it's impossible to tell what someone will consider "too much!" to spend on interconnects and speaker cables. Over the course of time I've reviewed some very pricey cables, but one brand I recommend regularly to readers who ask for advice is Acoustic Zen, whose products peg the cost/performance meter. Yes, Acoustic Zen's Silver Reference II interconnects ($948 per meter pair) and Hologram II speaker cables ($1048 per eight-foot pair) are expensive, but they also come very close to or surpass so many other interconnects and speaker cables, some of which cost even more money, that they are very easy to endorse. What makes Acoustic Zen cables so good? The same thing I just praised about Siltech's Signature G6 Forbes Lake interconnects and Eskay Creek speaker cables: completeness of performance. 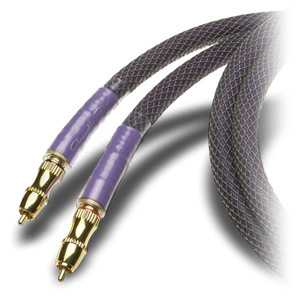 Acoustic Zen cables do everything well -- resolution, spectral balance, bass, midrange transparency, the works. 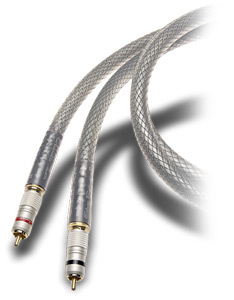 Silver cables are often jeered for a perceived shift toward the high frequencies, but the Silver Reference II interconnects do not suffer from this. Instead, there is an evenhanded portrayal of all musical information, from the highest highs to the lowest lows. Other cables will do one or a few things better, but their prices will be such that the differences will seem minor compared to the overall adeptness of the Acoustic Zen sound. I used the original Silver Reference interconnects and Hologram speaker cables for some time, enjoying them immensely. The Mk II iterations retain the supreme balance of the originals, but add to my ears a bit more transparency in the midrange and airiness in the treble. Image outlines are more confidently drawn, which gives musicians greater presence and specificity, especially during complex passages in classical works. Overall Silver Reference II and Hologram II delineate and separate the elements of a performance a little better while still retaining the evenhandedness that makes Acoustic Zen cables such an easy recommendation. You can spend more money on cables, but I'm not sure you can buy better cables for the money than Acoustic Zen Silver Reference II and Hologram II, whose prices, it should be noted, haven't changed but whose performance is even better than that of their very worthy predecessors. Putting it all together, despite the impressive performance of the Silver Reference II interconnects, I still preferred using them exclusively between DAC and preamp with the Matrix Reference II between preamp and amp (as I did with the original versions). Going all silver certainly produced an extremely transparent, airy and rhythmically tight musical experience that I respected greatly but ultimately couldnt love -- details came across as a little too spot-lit and tonal colors a little light. Plugging in the Matrix Reference II flushed out things from piano soundboards to cymbal tonality more completely while also bringing a greater sense of heft and weight to elements within the soundstage. In short, with the Matrix Reference II/Silver Reference II combo the music blended into a more cohesive and expressive whole, but I could certainly see going all Silver Reference II or now even Matrix Reference II as systems and tastes demand. Overall, the Silver Reference II provides incremental improvement over its predecessor in some important areas. There are cleaner and smoother mids and highs, better imaging, and a perceived quieter musical backdrop. It is an extremely neutral-sounding cable that should not be thought of as a tone control or a remedy for high-frequency maladies, but rather as a pure conduit through which to hear everything your electronics have to offer, for better or worse. The Matrix Reference II, on the other hand, now sounds like a completely different interconnect, one that is cleaner, crisper, quicker, and more detailed than the more affable earlier version. Although I admittedly do miss some of the elders character traits, especially in the midrange, the newer versions less identifiable character and ability to communicate the full weight and tonal color contained within a performance make it a more balanced and better interconnect. The original Matrix Reference and Silver Reference were the best interconnects Ive had in my system, and the second iterations deliver meaningful improvement that serves to bring the musical event that much closer to being. Although not cheap, theyll get you most of the way to state-of-the-art performance at significantly less than state-of-the-art prices, which makes them a most worthy audition to a wide swath of audiophiles. Prices: Matrix Reference II: $498 USD per single-ended meter pair, $548 balanced; Silver Reference II: $948 per single-ended meter pair, $998 balanced.